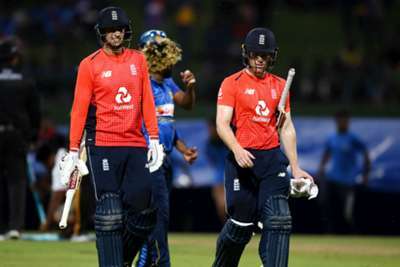 Eoin Morgan feels England have fallen short of their usual high standards in Sri Lanka despite sealing the ODI series with one match to spare on Saturday. The tourists came out on top in yet another match which could not be completed due to rain in Kandy, securing an 18-run Duckworth-Lewis-Stern victory to take a 3-0 lead. England were 132-2 from 27 overs in reply to Sri Lanka's 273-7 when the heavens opened and no further play was possible, the in-form Morgan unbeaten on 31 and Joe Root 32 not out after Jason Roy had made 45. Spinners Moeen Ali (2-55) and Adil Rashid (1-36) impressed with the ball, but England were not as sharp as Morgan would have liked in the field and the captain says there is room for improvement from the top-ranked side. "It's nice, but I think we have to continue being honest with ourselves," said the skipper. "We have played some good cricket along the way and the series that probably stand out are India in particular, Australia and New Zealand away. But we haven't played great cricket so far in this tour. "We are quite honest with where we're at and where we need to improve. Today it was fielding, we were quite rusty, and we maybe could have been more disciplined in the areas that we bowled." Sri Lanka captain Dinesh Chandimal felt it could have been a different story if Root had been dismissed when he was caught sweeping, but got a reprieve as umpire Lyndon Hannibal spotted they did not have enough men in the circle. "If it was not a no-ball we could have won the game but that's our mistake." said Chandimal.